If you already own a condo in the Homewood, California community and want to know what your property is worth, call me 530.414.1260 for a confidential consultation. Looking for more information on Homewood Condos for Sale complexes and developments? In the Homewood, California area there are only two condominium / townhouse developments in the entire community. Building was limited in this area, and the selection of condos for sale, or homes for sale in Homewood, California has always been limited. Both developments are near the Homewood Ski Resort, and both are luxury resort-lifestyle living developments. For the buyer who has to have the very best Fleur du Lac Estates is one of the most well-known, prestigious, sought-after concierge developments in the entire North Lake Tahoe area. The opportunity to buy a condo in the Homewood, California area, or on the West Shore of Lake Tahoe is very limited. The development of larger complexes did not happen. As a result you may not know that in the Homewood area, there are only sixty-five (65) condo units in the entire area. All units are located in lakefront developments and are more expensive with a starting price in the upper $1 million range, and then they go up from there depending on the condition of the unit, location, view, setting, and development amenities. 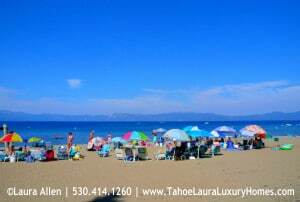 Need more help in trying to figure out your Lake Tahoe condo buying options? Do you want help figuring out the HOA fees for the different developments, or which locations will best meet your individual needs? Call me at 530.414.1260 and I can help you find the right place to buy!